A two week long trip in 2015 united 11 young archaeologists focussed on the LBA / EIA in the Northern Aegean and Southern Balkans and brought them on the traces of late prehistoric pottery from Central and Western Macedonia to Epirus, Albania, F.Y.R.O.M., Kosovo and SW Bulgaria. 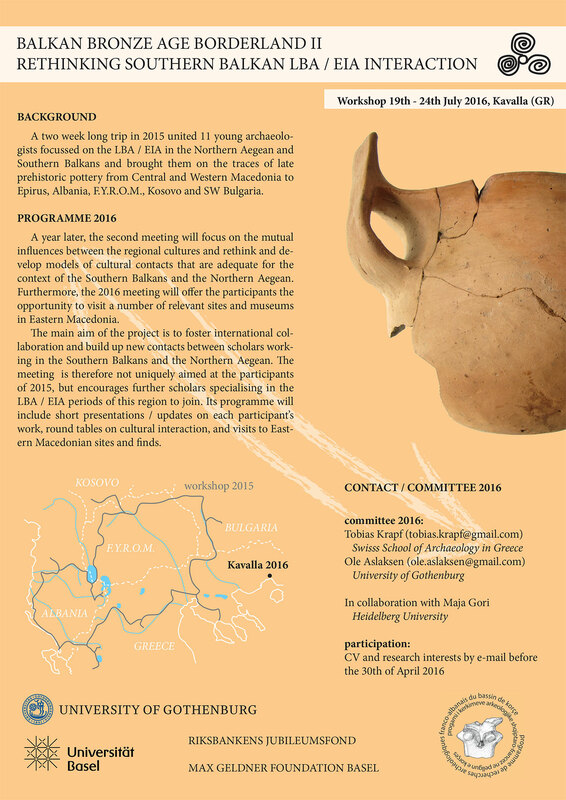 A year later, the second meeting, entitled “Balkan Bronze Age Borderland II. Rethinking Southern Balkan LBA / EIA Interaction” will focus on the mutual influences between the regional cultures and rethink and develop models of cultural contacts that are adequate for the context of the Southern Balkans and the Northern Aegean. Furthermore, the 2016 meeting will offer the participants the opportunity to visit a number of relevant sites and museums in Eastern Macedonia. The main aim of the project is to foster international collaboration and build up new contacts between scholars working in the Southern Balkans and the Northern Aegean. The meeting is therefore not uniquely aimed at the participants of 2015, but encourages further scholars specialising in the LBA / EIA periods of this region to join. Its programme will include short presentations / updates on each participant’s work, round tables on cultural interaction, and visits to Eastern Macedonian sites and finds.